If you are an engineer then i am sure you are well aware of the many different plugs and sockets in use in data centers. But first-time experience in a foreign data center might be hard if you don’t know which power cord is used there. There is more than one standard being used in the world. 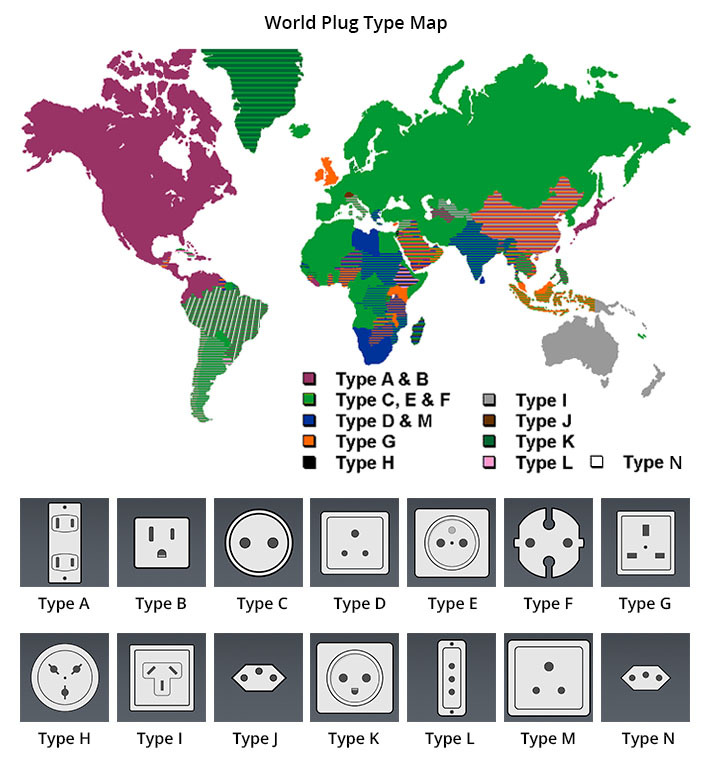 Different country may use different power cords plugs and connectors, especially the plug types. IEC 60320 is a set of standards specifying power cords appliances up to 250 volts. Though different country owns different power cords standards, the IEC 60320 is recognized as an international standard used by most countries in the world. The “C” represents the code standard for connectors made by IEC 60320. Different types of connector are specified for different combinations of current, voltage and temperature. IEC 60320 standard uses even number for plug and odd number for the mating receptacle, and usually male appliance inlet is 1 higher than the sheet for the corresponding female cable connector. 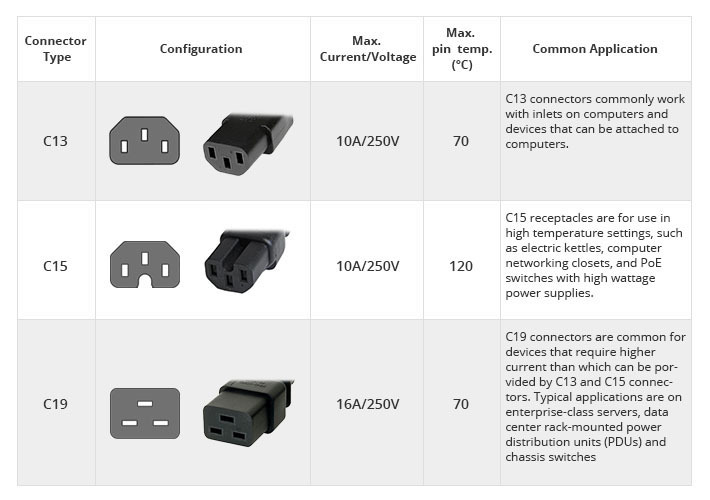 Therefore the most common used power cord types is C14 to C13 and C20 to C19. Other common power cords also include C14 to C15 and C20 to C15. Though IEC 60320 standard is used by most countries in the world, in fact it mainly aims the connectors types (C13, C15, C19). For plugs types, it differs from country to country. The NEMA standards are commonly adopted in most North American countries and some countries that follow NEMA standard. Among the NEMA 5-15P plug are the most widely used in sockets. They are three-wire circuits (hot, neutral and ground), and are rated at 15 A at 250 V, although they usually carry 110 V.
NEMA 5-15P to NEMA 5-15R power cord is the most common type. The NEMA 5-15P stands for the plug, and the NEMA 5-15R stands for the receptacle. Other frequently used power cord types that use NEMA 5-15 plug include NEMA 5-15P to C13 and NEMA 5-15P to C15. CEE 7/7 is now the de facto plug standard in many European countries, and in some countries that follow CENELEC standard. European countries that do not use CEE 7/7 are Denmark (AFSNIT 107-2-D1), Ireland, Italy (CEI 23-50), Malta (BS 1363), Cyprus (BS 1363), Gibraltar (BS 1363) and Switzerland (SEV 1011). 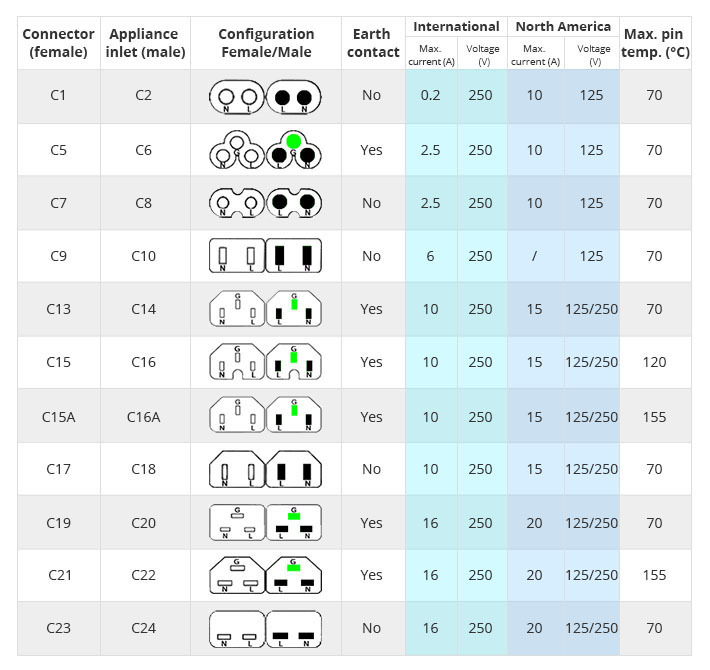 The most popular power cords that adopt CEE 7/7 plug include CEE 7/7 to C13, CEE 7/7 to C15, and CEE 7/7 to C19. Some other countries also have their own plug standard. For example, Australian standard AS/NZS 3112 (Type I), Brazilian standard NBR 14136 and Japanese standard JIS C 8303 (Type A, B), etc. But one common thing is that they might all adopt the IEC 60320 connector standard.